Remember your first time? Maybe it was choppy, maybe it was oddly charming, but it was probably years ago. Not *that* first time. The first time you watched a webseries or YouTube video. Well, I’m going to tell you about my first time writing one. I’ve just signed on as a writer for The Lizzie Bennet Diaries, based on one of the most beloved works of English literature: Pride & Prejudice, by Jane Austin. My first episode was shot last Saturday! First of all, let me tell you webseries have come a long way, baby. Lizzie Bennet Diaries was featured yesterday on Wired and the attention keeps growing. What happens when you mix professional actors and writers with a good property? Nearly 200,000 views! 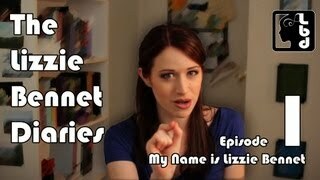 Lizzie Bennet Diaries happens to be in vlog format. While some other scripted webseries emulate their TV/feature cousins, LBD embraces a format developed by and for the vlogger community. As a writer, that means ignoring the age-old admonishment to avoid soliloquies, and go on and embrace talking to camera. It also means more opportunities to editorialize literally and figuratively and for quick cutaways, while allowing the characters to be aware that all this is going on and even drive the edits. The medium and the format thus is the narrative in many ways, which is my personal Holy Hand Grenade of Antioch. Add to the vlog supporting social media accounts from the other characters, and you have a robust “world” spread across multiple platforms. You know what that means. Your buzz word sense must be tingling, because I’m about to say it: it’s transmedia! So follow the latest adventures of Lizzie Bennet and her sisters on her vlog or on their Twitter and Tumblr accounts, and brush up on Pride & Prejudice. I can tell you webseries aren’t the only ones who’ve come a long way. What properties do you think would be ripe for a webseries/transmedia adaptation? Or do you think original series are the way to go on the interwebs?